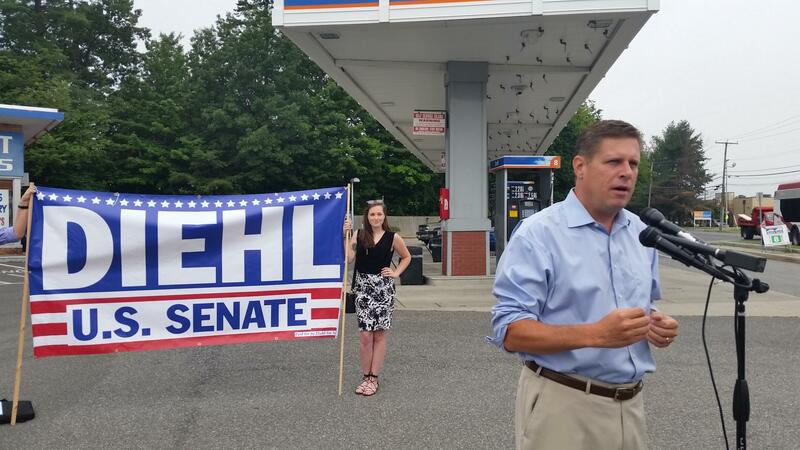 Republican Geoff Diehl is seen at a campaign appearance in Springfield, MA in 2017. He is challenging Democratic Senator Elizabeth Warren's bid for a second term. The Republican challenging Democratic U.S. Senator Elizabeth Warren in Massachusetts has released the first TV ad of the campaign. In the 30 second ad, Geoff Diehl, a state legislator who is an outspoken supporter of President Trump, said he is running to stop partisan gridlock in Washington. In a press release touting the ad, Diehl renewed a call for Warren to quit her reelection campaign now that she has confirmed an interest in running for president. Warren told a town hall audience in Holyoke over the weekend that she’d “take a hard look” at a White House run after next month’s midterm election. Her campaign said she will not drop out of the race for Senate. A WBUR/MassINC poll last week had Warren with a 27 point lead over her Republican challenger.